A look at life with the Wilder family. Updated most weekends and some vacation days. You can contact me at movingnorth@gmail.com..
Up in Alaska - Juneau! A Sense of Place - Alaska! Girdwood - City on the Move. - Alaska! Juneau Through Heather's Eyes - Alaska! Life with Dogs in the Yukon! The Truckin' Blog - Good Stuff! The Crazy Rants of Samantha Burns - Funny! Table for 4 - Fairbanks! Shawn Kielty Photography - Great Pics! Suess's Alaskan Adventure - Fairbanks! Tundra Medicine Dreams - Alaska! The start line of the Yukon Quest, which I could join if they would let me mush with two terriers, a minature poodle, and a goofy husky/cocker mix. The frenzy started about 10AM. By frenzy, I mean the argument. I go back to doing what I’m doing. He’s said okay, right? I hear motion, The Boy moving hither and yon. I assume he’s doing what I told him to do. On the way to get yet more coffee, I look and see his feet are still as bare as Jessica Simpson’s résumé. I’ve got to think that Jessica Simpson’s résumé is as Zen-like as her thought, stripped of all the superfluous parts of life (such as knowing how to read, or how to fill out the name block on the SAT) and just concerned with staring blankly. Sorry, went down a side road . . .
He’s right, of course. We’ll be tramping all through the snow, so snow boots make sense. 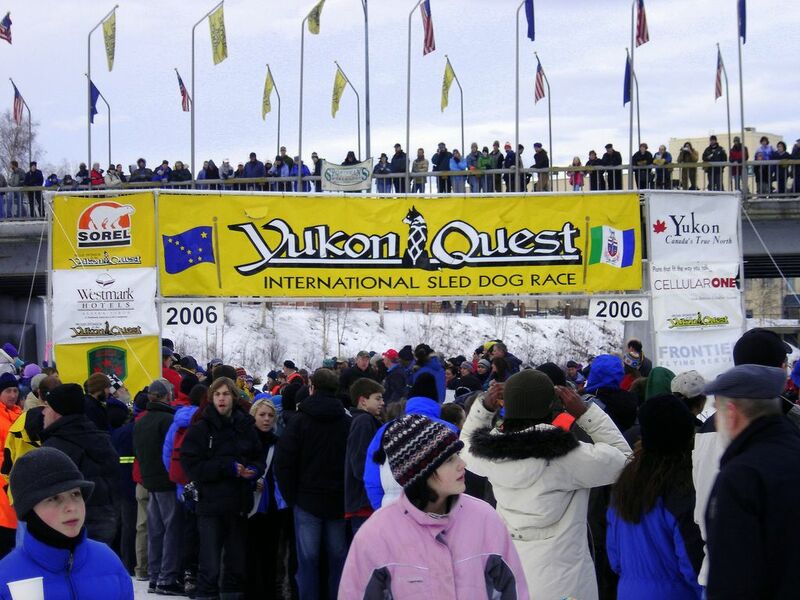 The place we’re going, of course, is the start of the Yukon Quest. 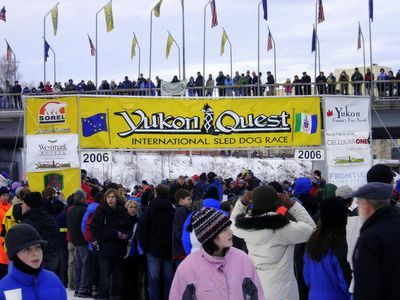 The Yukon Quest is billed as the “Toughest Sled Dog Race in the World.” I think I’d believe them, since the race starts either in Fairbanks, Alaska or Whitehorse, Yukon Territory in February and covers a distance of about 1000 miles (175,000 kilometers). We start the race in Fairbanks in even years, and it starts in Canada on the odd years. Given that the race takes place in February, it can get darn cold on the trail. Boots would be a good idea, especially if I decided to strap The Boy to a sled dog and scoot him off to the Yukon. Heck, even the sled dogs wear boots on this trip (that's true - read the rules). So, we get dressed in a frenzy. I look out at the thermometer in the front yard, the same one that indicated only last month that it was below -50ºF, and see that today it’s in the 30’s. I opt for a rugby shirt. I don’t want to overheat with weather this warm. The Boy puts on his jacket, and off we go. We arrive in downtown Fairbanks just in time to see the first dogs heading off. We park illegally, and then make our way down to the river. In Fairbanks, in winter, walking on water is no big trick, since it’s all frozen. I show The Boy the ice of the Chena River under the coating of snow. He's unimpressed - in Alaska the river is frozen a great deal of time, so what's the big deal, Old Man? We finally get to the end of the start chute, and because he’s short, I offer to put him on my shoulders so he can see the dogs take off. The end of the chute is perhaps the worst place to watch the race from – it’s crowded, and the pictures are all obscured by folks moving into the camera field of view, as if they’re gigantic people-moths that are drawn to the photon catching thingamabob that turns light into digital photos. Dang people-moths. The Boy wants to move on. I spy that the crowd is much thinner back behind the starting line. The Boy and I make our way there, and proceed to watch the mushers and their dogs (the reason we’re here, after all) drive on up to the starting line. 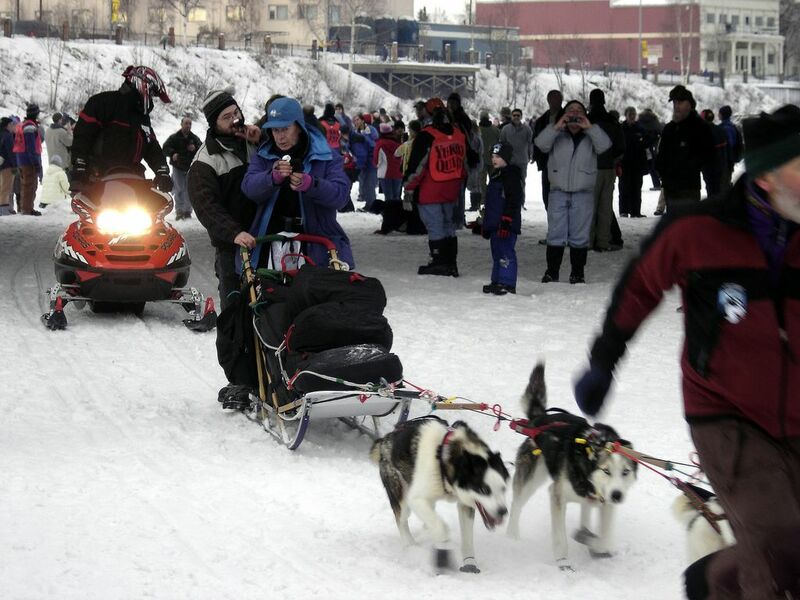 The start is staggered at two-minute intervals (except when one musher decided to give everyone else a head-start and miss their time. My guess overall is that since the closest finish in this race was a five minute interval, so the extra ten seconds is probably not worth mentioning, except perhaps on a psychological level – after all, the record time to complete the race is 10 days). A video of a typical start is will be linked up here as soon as Google observes it's not pictures of Roseanne and George Clooney in an intimate moment (she says it happened . . .). It’s about 6.9MB (the video, not George Clooney) so if you’re on a slow connection and only want to download one thing today, I’d probably choose something else. Notes if you watch it: The hay bale is bedding for the dogs, and the snowmachine holds the dogs in place until it’s time to start. So, Nice Lady zipped up The Boy’s jacket. I marveled at his manipulation – here is a kid who regularly jumps outside and spends a half-hour or so out in -10ºF merely so he can scam some hot cocoa off the back end, and is perfectly capable of zipping up his own jacket. Perhaps he thought Nice Lady would take him home and pamper him with bon-bons,cartoons, and Hot Wheels. He was disappointed. I endured the, “I know it seems so warm after -50ºF a week ago but it's really cold out here." (Complete with the unspoken, "Some people.") lecture. I smiled politely, knowing that The Boy would bike naked at 10ºF if we didn't keep a close eye on him. There would be no cocoa for The Boy when we got home. After a bit, we left. We climbed up the banks of the Chena to the waiting parking lot and my illegally parked car. The Boy pretended he was climbing a great mountain. Elapsed time, ninety minutes, shoes and socks to back home, shoes and socks flopped about the front room like congressmen at an open bar. The Boy ended up with Skittles instead of cocoa. I didn’t have to check back and make sure that he ate the Skittles. I've got about 30 more pictures, at 2MB each. Now, how do you propose I share???? If your ever in Portland, and you need a sitter...I am available. If we get down there, we'll take you up on that! Oh, and he can zip up his own coat!! Us Orygun hippies are granola eating nudists. I figured you'd be comfortable with that. It does rain though and we do wear coats when we go out...but leave the umbrella. I ain't babysittin' no Nancy-Boy that uses an umbrella. I got a reputation as a true Portlander, we don't need no stinking umbrellas! Great photos at that link John! The best one and closest of a musher just happened to be of my neighbor, which I'll now send to everyone in the 'hood! Good job! I take everything back about the frozen boy and crazy lady. Nice pictures. Thanks! I don't know why they show up under Dec 25, 2004, but it is just like Christmas. I think this could become an EVEN BIGGER EVENT if they would get sponsors on the dogs/sleds. You know, more like Nascar! Did you ask the nice lady how well she chops wood and takes the garbage out?